I hit Pinterest with a vengeance when it looked like we might buy the less than perfect lake house. You can visit my lake house board here. It is no secret that I love cottage interiors. Deep in my soul that is the style I feel most comfortable with. I try to temper my love for all things cottage with Bill's more lodgey and contemporary preferences. Since the lake house deal is dead, I decided to "cottage" up the beds for summer. There were colorful elements lurking in the armoires even though the beds have been monochromatic for the last few years. The base for the master bedroom was a king size dust ruffle from Ralph Lauren. Macy's had it on clearance about three or four years ago. eBay came to the rescue when no other components could be found. A seller made pillow covers out of designer sheets. Changing out a bed for the seasons is as easy as making the bed. The only challenging part is wrestling the mattress to get the dust ruffle on. Once the ruffle was in place, it was time to pull out pillow cases and shams to see which direction to go. I love the chambray color cases with the lace peeking out from underneath. I've had these a long time. They've been part of many different bedding sets. 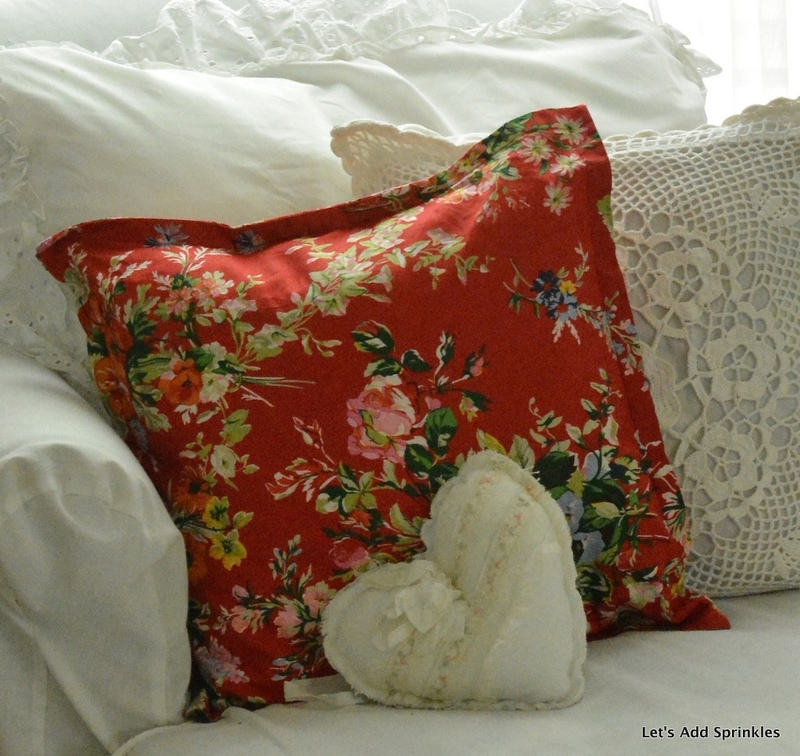 Layering an ordinary pillow case with a lace one underneath elevates the bedding. The red ticking cover came from Pottery Barn. The YoYo pillow top came from the old craft mall in town. The white embroidered pillow is Chaps by Ralph Lauren. It's been on the bed for years. 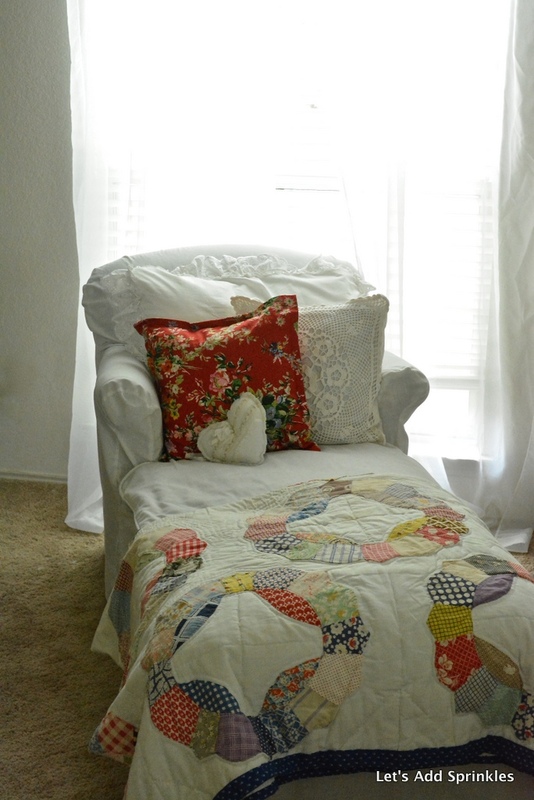 The quilt at the end of the chaise came from my grandmother. I was repairing this quilt almost 33 years ago on Valentine's Day. Bill called. I knew then that he liked me. We started dating two months later and were married the next year. I made a little sailboat quilt for Chris almost 30 years ago for his "big boy" bed. He says he cannot be trusted with it yet, so it stays here for safe keeping. The other quilt resting on the school house desk came from a garage sale. I had a dream that morning that I found a quilt at a garage sale and I did. It was only a dollar. Daisies seem perfect with this cottage scheme. The lake scene painting also came from a garage sale. I'm adding a few patriotic touches to the house. I'll have those for you when I'm finished. I have "olden" chambray and Ralph Lauren pieces too that I will not part with. They go with everything sooner or later. loved the story of repairing the quilt when your true love called. I'd never let that quilt go. Totally charming, Katie. Happy summer to you! Katie, your bedding looks wonderful. My daughter has recently started redecorating her home in red, white, blue. We found her a white duvet cover and shams at a consignment shop. I had given her a dust ruffle that was a beige stripe. She bought red gingham fabric, and I sewed it over the old ruffle, now her dust ruffle is red with the white bedding, much like the look you have. She loves it so much. You did a fabulous job with this, using all the pillows!! Beautiful!